It was a race of highs and lows for Maximum Motorsport at the 2012 Armor All Bathurst 12 Hour. The marathon race, held at the world-famous Mt Panorama circuit, boasted an exotic field of entries, including a trio of Audi R8s, Ferrari 458s, Mercedes SLS AMG GT3s, Lamborghini Gallardo GT3s and Porsche 997 GT3s. 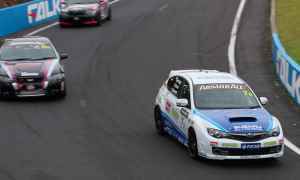 Despite the number of super cars, the Maximum WRX STI was moving forward, sitting in the top 10 and the Production Car lead for much of the event. 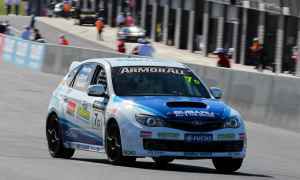 However late-race turbo problems cost the Subaru WRX STI an agonising 45 minutes in the pits. 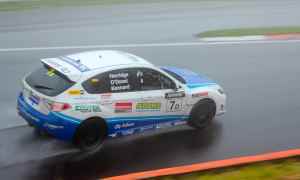 Although the team fixed the problem and completed the event for a Class D 2nd place, there were not enough laps to make up the time lost. The race was won by the Audi R8 of Mies/O’Young/Joens, a lap ahead of the Mercedes SLS of Slade/Bleekemolen. A three hour highlights package will air on Foxtel’s Speed Channel on Saturday the 24th of March, and you can find photos of the event in the photo gallery. This entry was posted on Thursday, March 8th, 2012 at 10:05 am.